I’ve told you about my friend Bethany’s son Renn, before. 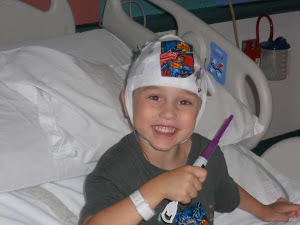 He’s a brave little guy, six years old, dealing with a complicated form of epilepsy. He has been through test after test after test, that have all been inconclusive. He’s headed back to hospital in August, and is scheduled for two or possibly three brain surgeries. He’s not scared, he’s quite matter of fact about it. He does have a wish, however. One very BIG wish. He is possibly the biggest Star Wars fan that there is. He wants to meet George Lucas, the creative force behind Star Wars. Many of us who care about this family are banding together to send that wish out into the cyber-universe, hoping that the Force will be with our Jedi Renn. You can help, if you’re willing. If you’re on Facebook or Twitter, would you consider sharing the picture below? Bethany has also written a blog post about Renn’s wish, on her blog “The Brain of a Jedi,” and sharing it would be wonderful, too. 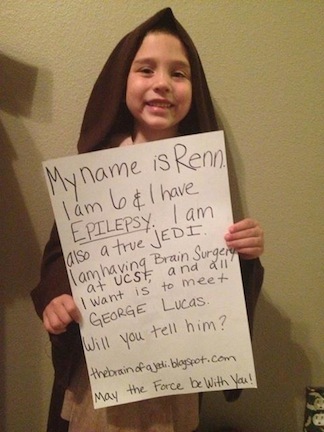 If you share it, on either Facebook or Twitter, please use the hashtag #JediRenn. Wouldn’t it be great if we could make this happen for him? I hope George will get wind of the plan through all our cyberspace noise!!! It would be beyond wonderful if this could happen. Here’s hoping! Thanks, Angela! You’re a gem! I’m joining in! I am going to post it on my blog, on my Facebook (and my Mom’s (although she might post it there 😉 )) and tell everyone to spread the word! Yay Erik and Yay Erik’s Mom! Thank you! You’re the best for sharing this, Beth. I’ll do my part, too! Posted on twitter and on FB. Such a good cause. Great that you got George Lucas’ FB address. I have a good feeling about this! Cathing up and saw this post. I’ve posted on FB and Twitter.